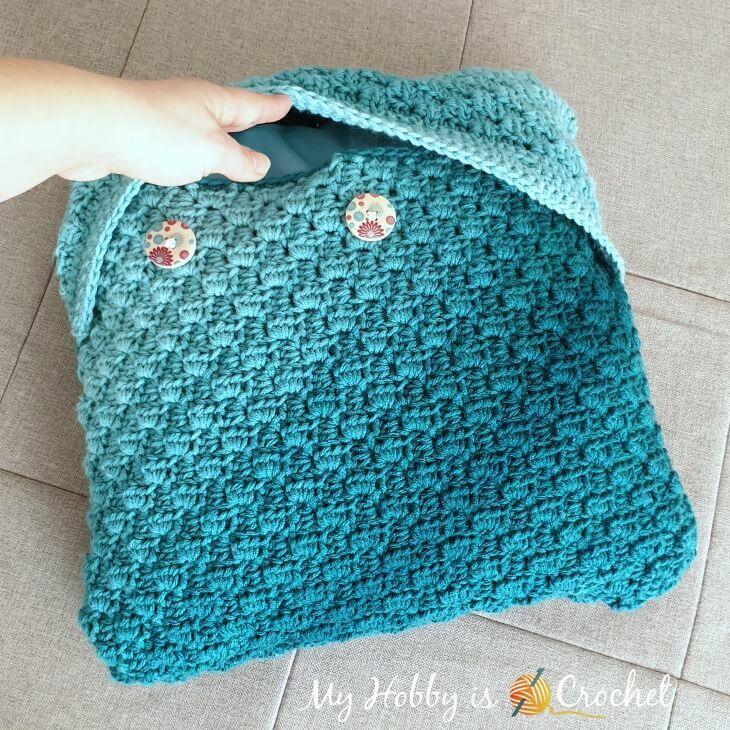 Learn how to crochet an envelope style of C2C pillow case that you can easily remove for washing or change it every time you want. 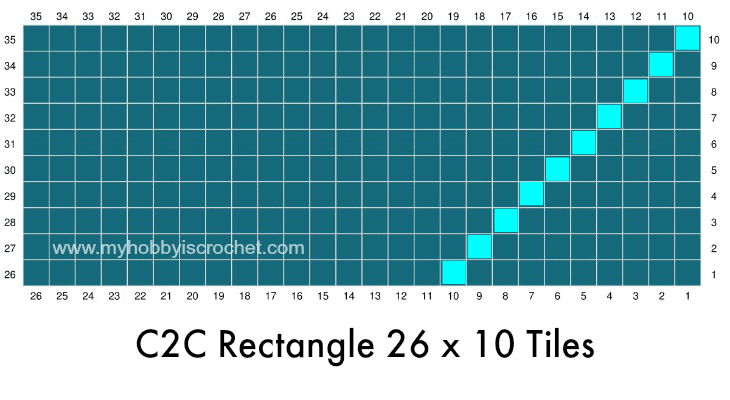 This removable C2C pillow case design will be the base for all my Animal C2C pillow cases. 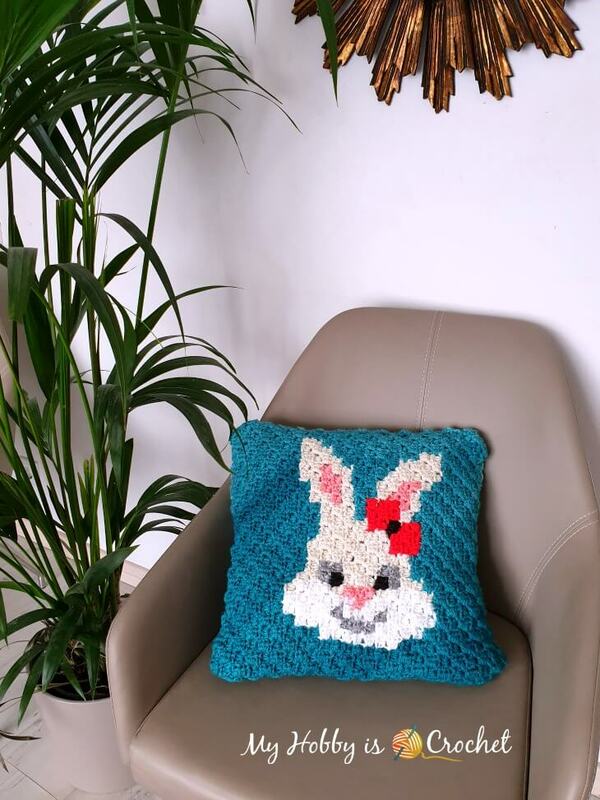 For the front side of the pillow case, you can choose any of my Animal C2C Square patterns (at the time available the Sassy Bunny and the Woolly Sheep). 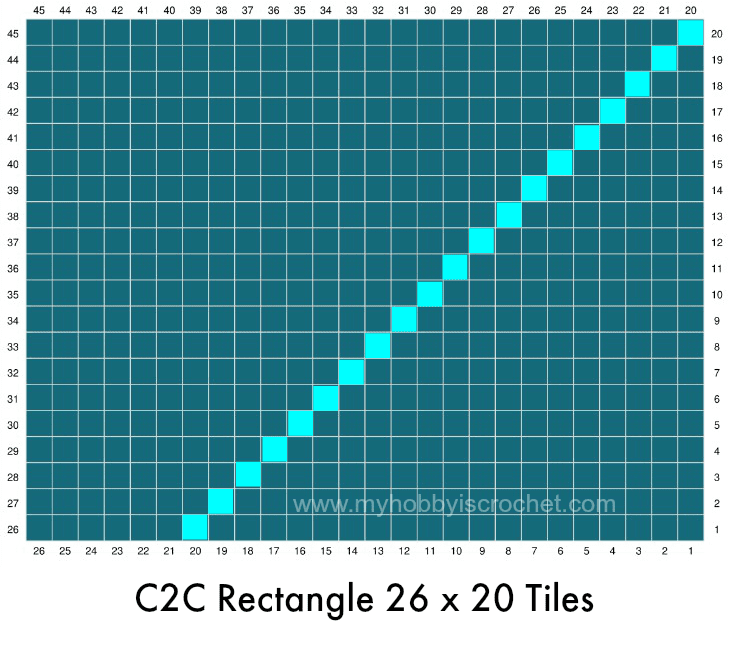 You could also make a plain C2C Square of 26 x26 tiles. 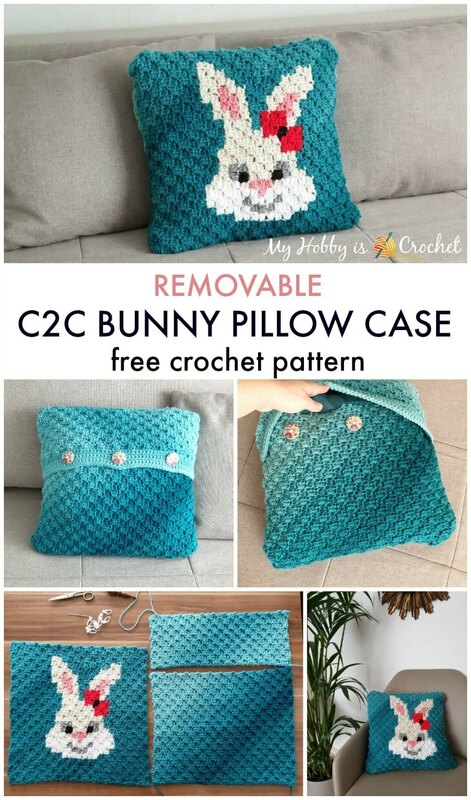 The Sassy Bunny Pillow Case would be great to decorate your couches and chairs for Easter, but also to decorate a baby's/child's room! - one panel of 26 tiles x 20 tiles (R2). 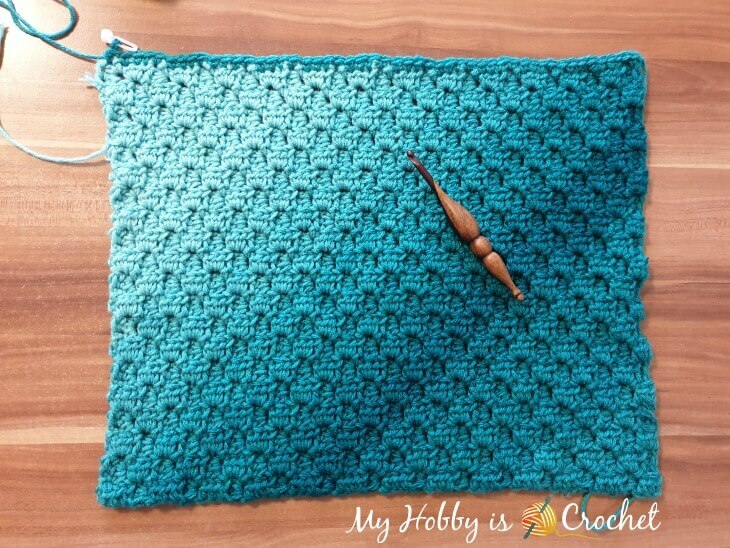 The same as the square front panel, the 2 rectangular back panels are worked with the Corner to Corner (C2C) technique using the hdc (half double crochet) stitch. You will work each piece on the diagonal starting from bottom right corner to top left. 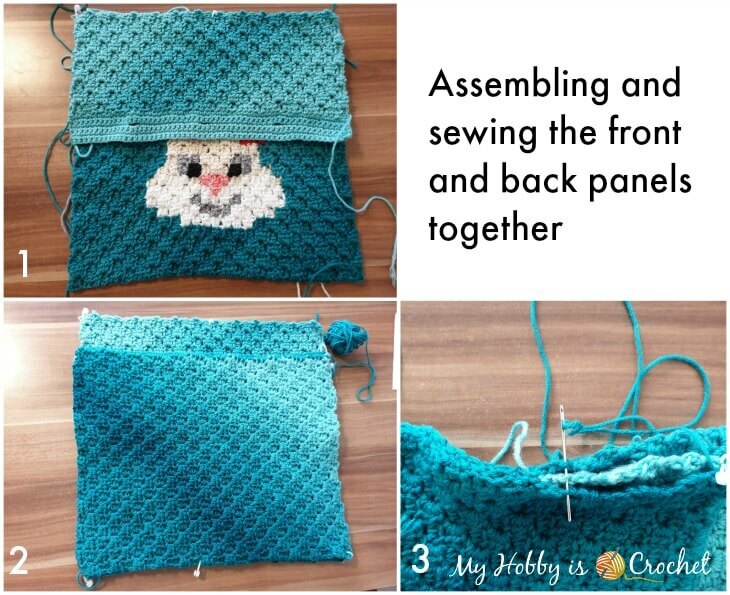 If you have never worked a C2C Rectangle/ Square in hdc, I would recommend you to watch the video tutorial embedded at the end of the instructions below. Row 1: Start with ch5. Work 1hdc in 3rd ch from hook and 1 hdc in each of next 2 ch. (The 2 skipped chains at beg of row will be a ch2sp). You made the First and only Box Stitch of row 1! From now on, you’ll start increasing 1 box st in each row. Row 2: Turn your work, ch 5, turn, work 1 hdc in 3rd ch from hook and 1 hdc in each of next 2 ch. (1st. box st of the 2nd row made). *sk all 3 hdc of next box st and slst into the ch2sp at left of that box st, ch 2, work 3 hdc in same ch2sp . (2nd. Box st of the 3rd row made); rep from * for the next box st (3rd. Box st of the 3rd row made). until you reach row 26. After that you will only decrease each row until you get to 1 box st by last row. Turn your work. Do not chain 5 anymore. sl st loosely into top of each hdc of the last box stitch made in the previous row, then slst into next ch2sp of last box st from previous row, ch 2, work 3 hdc into same ch2sp. Now you will crochet a Buttonhole Band for R1. Row 3: ch1, (1 sc in each of next 12 sc, ch3, sk next 3 sc) x 3 times, 1 sc in each of the next 12 sc; turn. You have made 3 buttonholes! Sc Edging on the upper edge of R2: Join yarn with a standing sc into the right upper corner of R2 and work sc evenly spaced along the long edge. The 3 pieces will be sandwiched and sewn together using the Mattress Stitch . The back pieces will overlap, creating the envelope type of pillow cover. 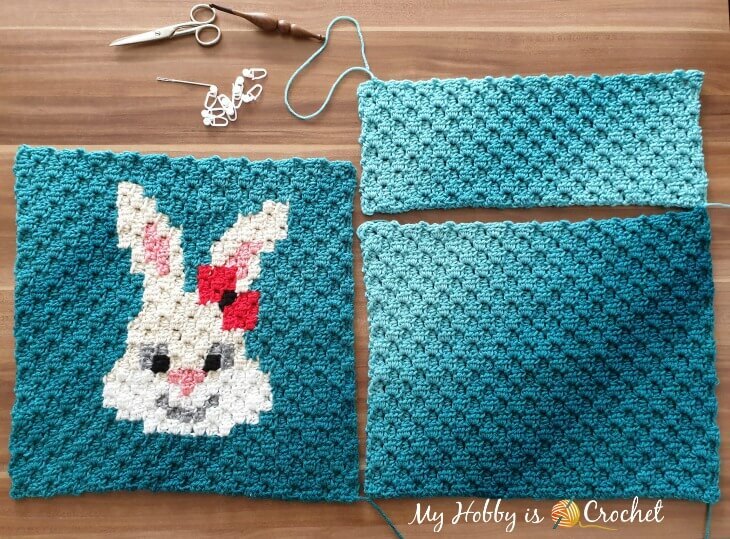 First lay down the Bunny (other animal square in my series) with the RS facing you, then place the rectangle with the buttonhole band down over it and pin the top corners together, as in the picture below. Now place the larger back panel (with the sc edging on top) so that the bottom corners are on top of each other. The back panels will overlap approx. 7 inches (18 cm) creating the envelope. Pin down and sew the 3 pieces together around the outer edges. Once you are done, turn the pillow cover right side out. You can now stuff your pillow into the cover through the back that is open. Many thanks to Red Heart Yarns for providing the yarns used for this pattern! vou tentar pegar o jeito! 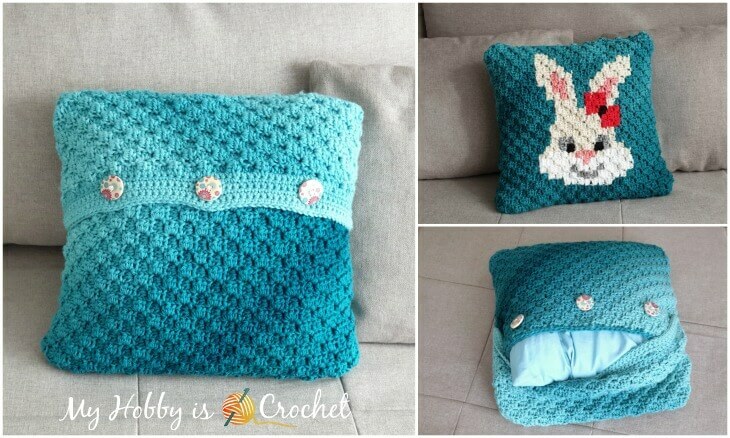 Hi, the pillow insert is 16 x 16 inches.